Ages and ages ago, Flyfour and I talked about wanting to go to Lee Valley (It's on the border of Hertfordshire, London and Essex) not just to see the White Water Course that we spent hours watching on the Telly during the 2012 Olympics, but because they had something that sounded great fun, so much so that because we hadn't gone to do this in the past five years and I really wanted to, I added it to my Birthday Bucket List, so that we would have to go. It was of course, Frisbee Golf. 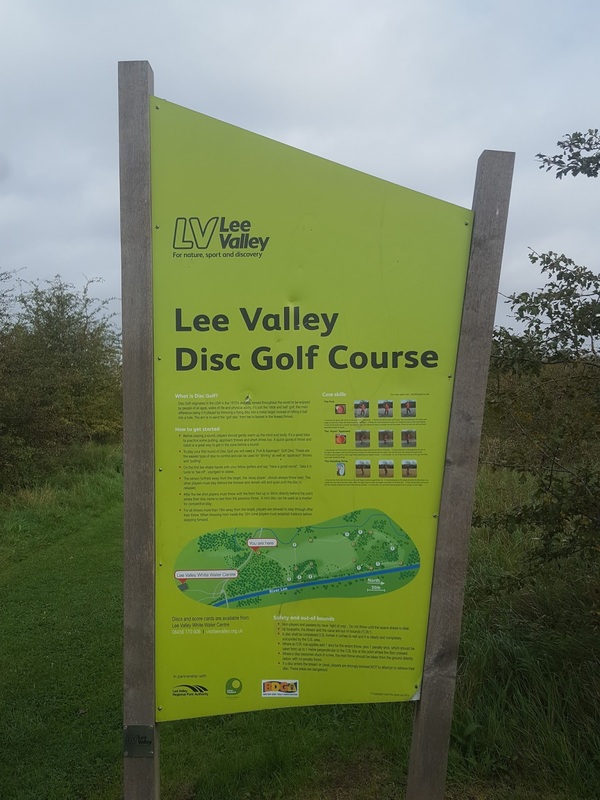 Yup, although at Lee Valley they call it Disc Golf, something which sounds a little more grown up! The idea is still the same. You take a Frisbee and you stand at a marker and try to throw the disc to the metal target. Yeah. 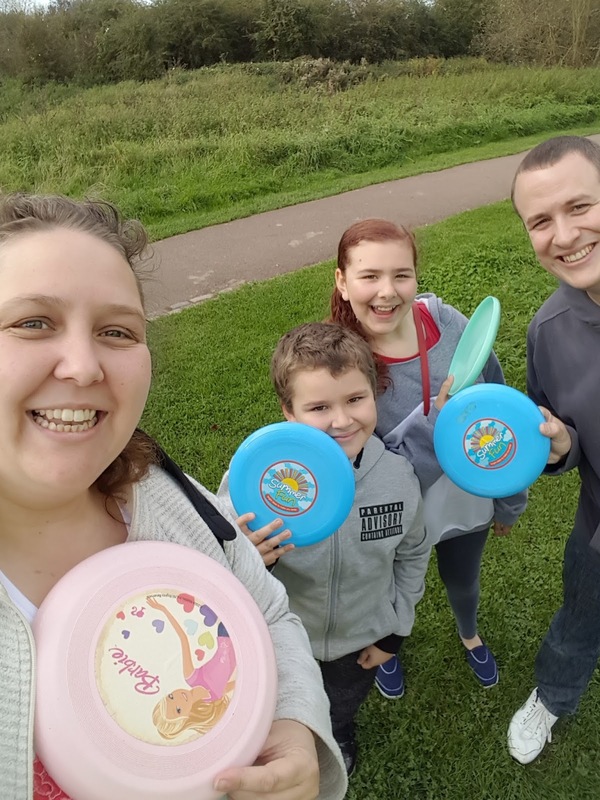 Simple, if you are the kind of family that know how to throw a Frisbee! Which funny enough isn't something that I've ever thought to teach the children and Flyfour and I aren't exactly naturals either! The whole way round the course, the only people we saw were Dog Walkers and despite a little mishap where someone put their finger in dog poo (it was Flyfour, not me!) and someone else who wasn't wearing socks got stung by a stinging nettle (It was Top Ender not me! ), we had a blast. Even Dan Jon, who was, well not exactly terrible compared to the rest of us, but probably the worst player to ever visit this course had a great time and if you don't believe me, here is a little video to prove it! There were several moments where we cracked each other up. Like when my Frisbee had gone into the rough at one point and so when I had finished helping Top Ender reach her Frisbee (It went under a bush/tree/plant thing that had branches close to the ground), I couldn't remember exactly where my Frisbee had landed. The children and I and then Flyfour and I spent a good five to ten minutes searching, only for Flyfour to find it almost next to the green and around 5 yards away from where I had directed us to search... Sorry honey! It was at this point that Flyfour made an interesting observation. 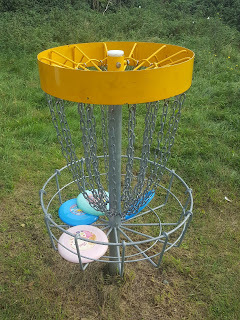 The winner was, of course, Flyfour who I think had secretly been practising his Frisbee throws at work and had put a curse on my Frisbee that meant it was allowed to hover over the metal target but not actually hit it.